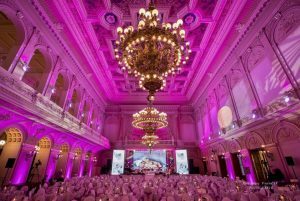 For the eighth time, our Czech partnering parent organisation Nedoklubko, has hosted and organised a conference in anticipation of World Prematurity Day 2018 at the prestigious Žofín Palace in Prague, Czech Republic. 150 neonatal nurses participated in this year’s conference which dealt with Psychology and Communication, two important aspects in the worklife of a neonatal nurse. Moreover, Nedoklubko also launched their new campaign “Help us with a heart”, where crocheted hearts, together with an uplifting message from a clinical psychologist, are given to families of preterms right after birth to give them strength and confidence (see guest article by Lucie Žáčková ). Mutually, from noon onwards, more than a hundred parents of preterms gathered to celebrate together but also to remember their children’s difficult start in life. At nightfall, the famous Dancing House, “Ginger and Fred”, as well as Žofín Palace were illuminated in purple. A charity dinner, where several awardees received the Purple Heart Award 2018, completed this eventful day. EFCNI is happy, grateful and also proud to be one of the awardees and says thank you for this gesture of appreciation. Nedoklubko has been active in supporting preterm babies and their families for 16 years. 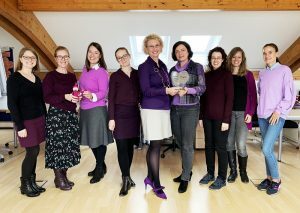 With the 17 November being a national holiday in the Czech Republic, World Prematurity Day festivities traditionally take place one week prior.